Fooodies....i love recipes with oreos. Here i came with a simple quick oreo recipe prepared in 5 minutes and you know one thing, this simple chocolate covered oreo recipe needs only 3 ingredients. Awwwwhh..its really superb !!!!! 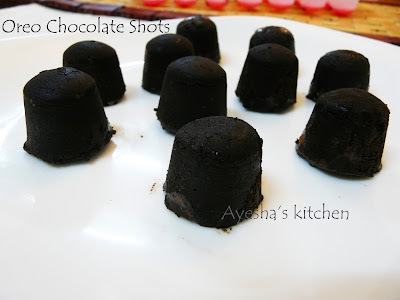 Dedicated specially to all oreo lovers who crave for easy oreo dessert recipes. You will definitely crave this more...Try it out friends and You can also have this twist with milk chocolate or white chocolate oreos too....!!!! Add oreo biscuit in the smallest jar of the blender and make fine powder. Then add butter to it and again blend for seconds. Transfer it to a plate, mix well and set aside. Now melt the chocolate chips / bars by double boiler method. Set aside. Take the silicon ice cube tray and fill it with powdered oreo. Press the sides well and make a small dig in the middle with your finger. (as in the image). Now pour half a tsp of melted chocolate in the middle. Then cover carefully with the powdered oreo and level it evenly. Freeze it for 4 - 5 hours and when done, flip it to the serving tray. Yummy delicious oreo chocolate shots ready. You can also use melted milk chocolate instead of dark chocolate.